This crowd-pleaser is tasty hot or chilled, but I serve it hot. 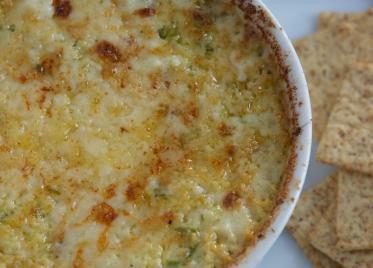 The melted cheese really opens up the flavor, and it also works great as a spread for grilled sandwiches. Squeeze the artichoke hearts to get as much of the juice out of them, then chop. You can also pulse them in a food processor. Mix in the rest of the ingredients. If serving warm (which is AWESOME), heat in the microwave or bake in a 350 degree oven for about 15 minutes. Mix in about a ½ cup cooked crab and serve warm. Or a pinch of dried tarragon. Ran out of time planning food for your party? Brad’s got you covered here. 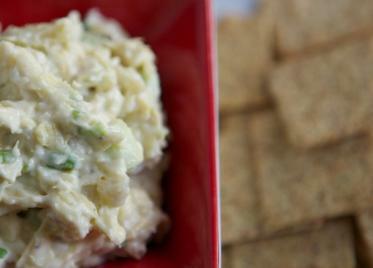 Whip up a ton of this Artichoke Dip, and serve an inexpensive Gruner Veltliner alongside. You can find 1 liter bottles for around $10.